In what the British media is calling a "guerrilla ad campaign," Nissan recently stickered a handful of its fleet cars with "kill" graphics signifying motorsport wins. The targets? Porsche, BMW, and Audi. Guess which one couldn't take a joke. The campaign, which extends across the United Kingdom, features billboards with Nürburgring race-win counts and taglines like "Kaisers Chiefed" and "The Winner Hans Down." 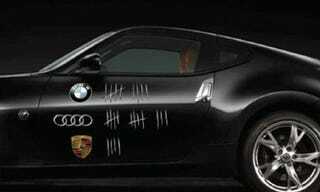 Porsche claims to have no issue with the larger campaign, but the firm's ire was raised at last month's Goodwood Festival of Speed when Nissan displayed several cars with hash-mark "kill" graphics. The cars sported the corporate logos of BMW, Audi, and Porsche. According to the Guardian, Porsche has approached Nissan requesting that the company's trademarked crest logo be removed from the campaign. Company spokesperson Andrea Baker said, "[The graphics] are our property and we do not give permission to any company to use our crests without our permission. This applies to any company." Of course it does. Ha! Good one. That's German humor, isn't it? No? Oh. OK, then. Trademark law: Ja, it stinks.